While ruby can be very expensive, most of the ruby gems that make it to the jewelry market are not of the highest quality. In a way we find it very heartening to see that, many gem lovers with medium sized budgets can afford natural ruby. 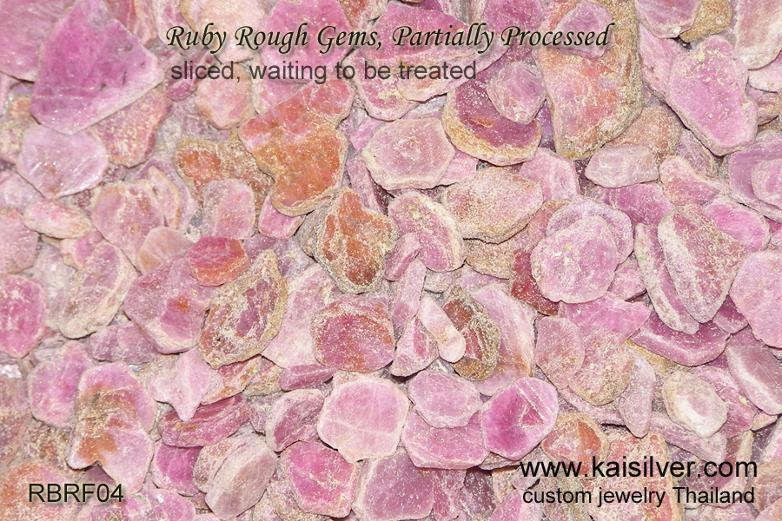 This report talks about the affordable ruby rough material that delivers sanely priced rubies 'for the rest of us'! The Kaisilver team made a tour of the rough gemstone market in Thailand, the idea was to get first hand information regarding rough ruby and what ruby cutters are doing with the material. Much of the affordable ruby gemstones come from the African mines though Mozambique ruby, has now placed itself beyond the reach of many ruby lovers. Mozambique, Tanzania and Madagascar are some places with significant ruby deposits though, quality is not always very high. One African gem merchant in Thailand even claims to have some ruby rough material mined in Liberia. Fissure filled or glass filled rubies as they are sometimes called, are still going strong but, we heard an interesting opinion from the country's leading glass filled ruby provider. The man has for the past 8-10 months concentrated on treating ruby rough with the old, heating process. He was leading the supplier list when fissure filled rubies were the rage and commanded handsome prices. He now realizes that the initial romance with this form of treatment is over. He lamented that he had in recent years put some fairly good ruby material into the fissure filling process, on second thoughts he hoped that he had gone for the conventional heat treatment instead. He had even contemplated putting the glass filled ruby material through a reverse process where, the stone could be stripped of the fissure filling. Once neutralized in this way, he could then run the same rough ruby through the conventional heat treatment. Our team advised him not to do that as, even the slightest trace of the filling material could be detected by a well equipped gem testing lab - this would then ruin his business and reputation. He was grateful for our advice and decided to avoid using the reverse treatment method. Besides taking off a major portion of the surrounding rock and giving some basic shape to the rough ruby, these stones have remained largely unprocessed. Much work would have to be put in to further, clean this rough ruby gemstone of the mother rock and reveal more of the gemstone. A decision would then be taken to heat or fissure fill the gemstone. After shining a powerful light on some of these pieces, we concluded that conventional heat treatment would at best yield ruby that was suitable for cutting smooth cabochon ruby gems. Rough ruby that has been stripped of the surrounding rock, you can see the ruby material more clearly. A seasoned rough ruby buyer could, make a fairly good estimate of the type of ruby that would be possible if this rough gemstone was heated. Serious gem and jewelry lovers are beginning to better appreciate, the true value of ruby that is either left untreated or is heated in the conventional way. This has made gem manufacturers aware that, treating the material by the glass fill method would give them significantly lower price points. For those of you who believe in the meta physical properties of gemstones and crystals, the external beauty of the gem would not always be top priority especially if, the gemstone involved isas expensive as ruby or sapphire. 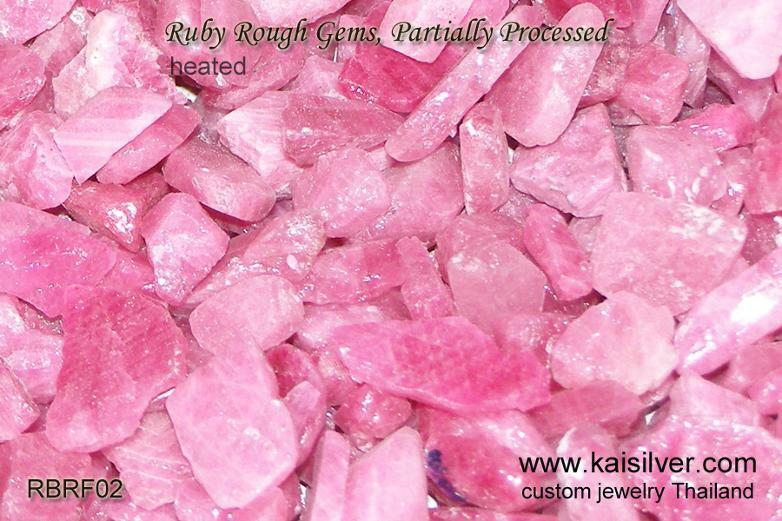 This is rough ruby after it has been put through the conventional heat treatment process. More than 90% of rubies and sapphires that command good prices in the markets, are heat treated to improve color and clarity. Gem experts accept this form of treatment as it is permanent and does not, result in the gem becoming weaker or unstable. The trained eye can observe that, this lot of heated rough ruby includes material that can be grouped into many grades. In cases where a single piece shows two distinctly different color hues, an experienced cutter might decide to cut the rough into two pieces and then cut, facet and polish each piece separately. The cut and polished rubies that are finally got from this lot could be in the 20 U.S$ to 200 U.S$ per carat price range. In the retail market that would translate to around 40 U.S$ to 500 U.S$ per carat. 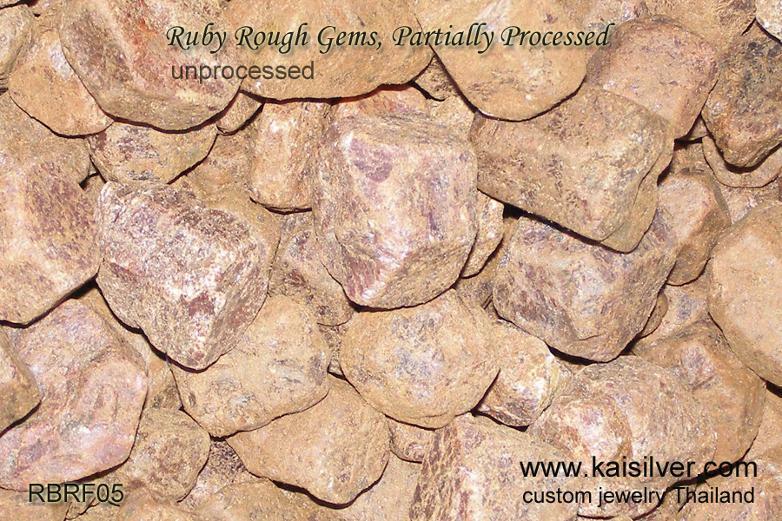 Utilizing the rough ruby with minimum wastage during the cutting process is absolutely important. We thought of sharing this image with you, it shows rough ruby that has been treated through the glass filled or fissure filled process. The stones look very pretty, much like candy with a glazed shine on the surface. 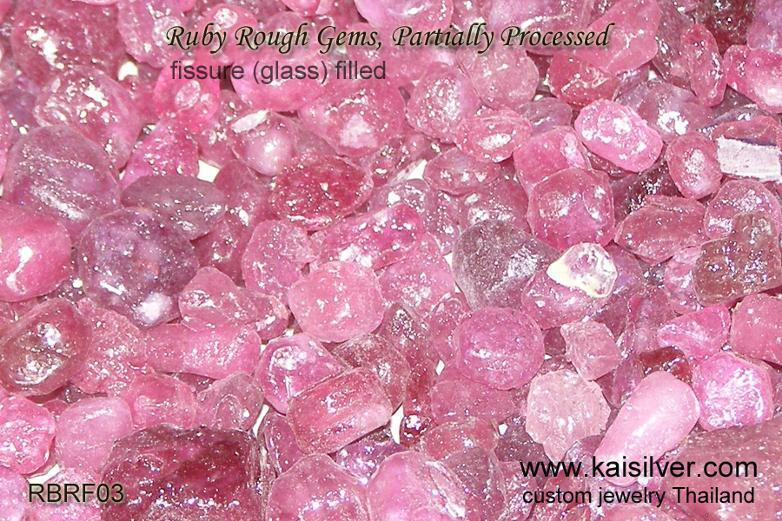 Once cut and polished, these fissure filled rubies will appear like very high quality ruby gemstones to the untrained eye. Since the glass element in these rubies does not form a homogeneous mix with the ruby, the material forms a composite mass with glass and ruby existing close to each other. It is important to understand that the fissure filling process reduces the durability of the gemstone, it therefore requires a degree of caution when being worn, stored or cleaned. There are also a few things that the jeweler needs to keep in mind when working with fissure filled rubies. One of Thailand's major fissure filled ruby processors, claims to have gone slow on manufacturing this material. He has instead, gone back to the conventional heating process for rubies. Interestingly the same manufacturer, is now doing substantial volumes of fissure filled blue sapphires. Important: We provide a large range of natural ruby gemstone options for our clients, the gems are generally heated or untreated. While we are in a position to provide fissure filled or glass filled rubies on specific request, we will do so only after the client clearly states that, he or she is aware that rubies being supplied are fissure filled. We generally use rubies that are in the 500 U.S$ to 3,000 U.S$ per carat price range. If you wish to order a custom made ring, pendant, earrings or any other ruby gemstone jewel from us, it would be a good idea to give us an estimate of your budget - this will allow us to pick the gemstone that is right for you. Kaisilver: The leading online provider of finely crafted custom jewellery in gold and sterling silver. More than 7,000 gem and jewelry lovers across 17 nations rely on us for all their gems and jewellery requirements. We place no restrictions on design or gemstones, this means that we are comfortable working with your designs or ours. With active working relationships at almost every gem mining center on all 5 continents and preferential access, to more than 200 million carats of cut and polished gemstones, we can procure and custom cut just about any gem that you desire. You can discuss your requirements or send your questions to the expert team at sales@kaisilver.com Our replies will focus on educating and informing you rather than on pushing for a sales order.